Greg Boertje-Obed, Michael Walli and Megan Rice are currently in the Irwin County Detention Facility in Ocilla, GA, awaiting their sentencing on January 28, 2014. The three were found guilty by a jury in Tennessee in May on two counts—Judge Amul Thapar revoked their pre-trial release saying they were technically guilty of a crime of violence and must be held. There are two things you can do to support Michael, Megan and Greg. You must make sure to include your entire return address on the outside of the envelope. No staples or paper clips can be included in your mail; no oversized envelopes. Magazines and books must be sent directly from the publisher or bookstore/Amazon. Photocopies of brief articles are likely to be permitted (based on our past experience). If you include inappropriate material or fail to comply with these rules, your mail will not get through—it will be returned to you. The second thing you can do is send a letter to Judge Thapar. Here are suggested guidelines for your letter. • Invite Judge Thapar to think about sentencing in light of the fact that this was an act of nonviolent civil disobedience intended to awaken the conscience of the nation, and no evidence was presented that it was an act of terrorism meant to harm anyone. You could write that you share the court’s concern that Congress would write a law that wouldn’t allow a judge to distinguish between peace activists and terrorists, and are disturbed that the government defines the crime they stand convicted of as a violent “crime of terrorism”. http://blogs.knoxnews.com/munger/2013/05/judge-rules-convicted-y-12-pro.html As testimony of the defendants showed during trial, they carried out their action in a spirit of nonviolence and hope. • Encourage him to consider downward departures from the high guidelines for the charges, and to use his discretion at sentencing to bring more justice into the situation by recognizing that the defendants are NOT violent terrorists as the government has implied through its interpretation of the crime; and remind him of the intentions of the three nonviolent activists: to follow the words of the prophet Isaiah to beat swords into plowshares, and build a safer and more secure world for all. Our purpose with these letters is not to reargue the case, nor is it to condemn nuclear weapons production—the judge is not engaging those issues at this time. Our purpose is to address the legal system’s distortion of the nonviolent action of the TNP resisters and to provide support to the judge for a sentencing decision that takes into account the nature of their action and their nonviolent behavior throughout their action. We would like for there to be a steady flow of letters to the judge’s chambers as well as a presentation of the letters by the lawyers at the time of sentencing – so in addition to sending a letter to the judge, please send a copy to attorney Bill Quigley. Sister Megan Rice, Greg Boertje-Obed and Michael Walli of Transform Now Plowshares are in jail now, ready to do hard time after being found guilty of property damage and sabotage at the Y-12 National Security Complex. As is usually the case with prophets, their words and actions are rejected by the masses who don’t understand their message or ignore it. For many, it is far easier to believe nuclear weapons components manufactured at Y-12 represent an undertaking consistent with the Gospel of Jesus Christ, a conclusion critically important to anyone who claims to be Christian. To conclude otherwise would mean assenting to the nuclear arms race (and by extension Y-12) being sinful, and followers of the Prince of Peace would have to align themselves, at least on a spiritual level, with the Plowshares. Many readers consider the three common criminals who deserve incarceration. But is that all there is? Are Sister Megan, a nun who spent years in Africa working among the poor, and Boertje-Obed and Walli, who also work among the poor in Catholic Worker communities, simply well-intentioned people who went off the deep end? It is easy to understand why local citizens prefer to keep any analysis of the Plowshares’ actions on an emotional level. Y-12 is a place of pride and economic security for thousands of East Tennessee citizens. Any effort to discredit that legacy is beyond the comprehension of many. But digging deeper — on intellectual and spiritual levels — is a discipline Christians should embrace. Jesus used parables to make us think and to challenge the status quo. It is clear the Plowshares did not comport themselves like other felons do. They took full responsibility for what they did — admitting their guilt from Day 1. They did not flee or profit from their crimes, and when the prosecutor asked Boertje-Obed if his actions constituted a publicity stunt, he replied, “Absolutely not.” Most importantly, the Plowshares testified they “spent months in prayer” before taking action. 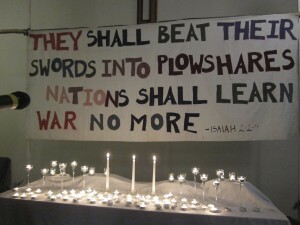 Agree or disagree, the Plowshares’ actions were shocking, reckless perhaps and self-sacrificial. I think it’s important that we take time to prayerfully contemplate what they did, and listen for God’s answer. It is easy to ignore the Plowshares, to shake your head in disgust at them. However, that’s the easy way out. Jesus told us: “You have heard it said, ‘An eye for an eye, a tooth for a tooth,’ but now I say to you, love your enemies, turn the other cheek, pray for those who persecute you.” A reasonable person might conclude even the threat to use nuclear weapons does not meet the “love your enemies” criteria. Let’s circle up the Sunday school chairs and have some serious conversations about this profound event. These folks are heading off to prison, and it’s worth knowing what it is about their faith that led them to embrace such great risk — and the scorn of many. 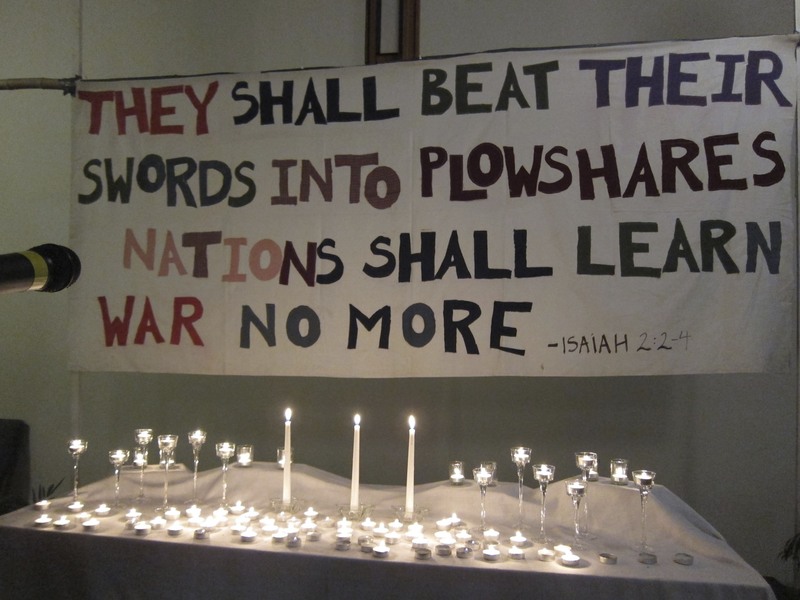 I would be happy to come to your church to participate in a prayerful, heartfelt, loving discussion about what the Transform Now Plowshares action might mean for us all. Patrick O’Neill and his wife, Mary, co-founderd the Fr. Charlie Mulholland Catholic Worker House, in Garner, N.C., which provides hospitality for people in crisis.